By creating an ePortfolio on the OpenLab, you will be setting up an ePortfolio Site and an associated ePortfolio Profile page. The steps below will take you through naming your ePortfolio, writing a short description, and uploading an avatar for your ePortfolio Profile page. You will also choose a URL for the ePortfolio Site and Privacy Settings for both the Profile and Site. 1. After logging in, click My OpenLab in the main menu. Then click + Create an ePortfolio in the right-hand menu. 1. On the first ePortfolio creation page, you will see a space to enter your ePortfolio name. It will already have a name filled in, based on your first and last name, but you can change that if you wish. We recommend that you follow this format: FirstName LastName’s ePortfolio (for example, Jane Smith’s ePortfolio). 2. Next, enter a description of your ePortfolio. You can always change this later, so if you don’t have a description prepared, just type something as a placeholder. 3. Check the appropriate boxes for your school and department. These are required. 4. Click Create a new ePortfolio site and choose a site URL. Like your name, this text box will already be filled in, based on your name. However, you can enter a different site URL if you wish. Once created, the URL cannot be changed, so consider it carefully. 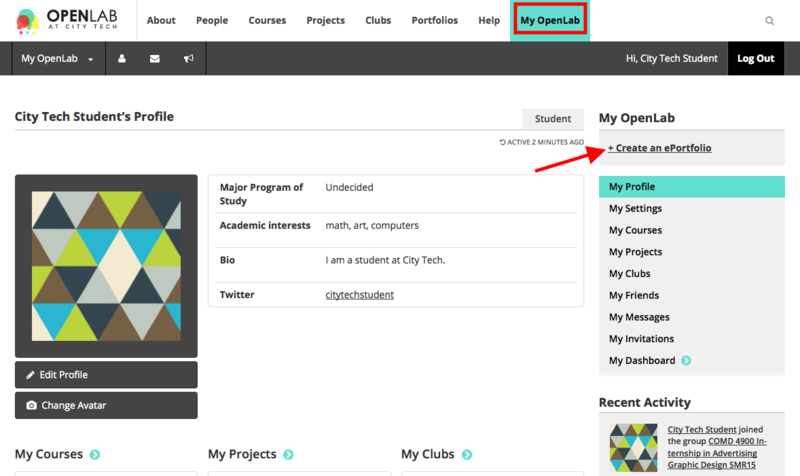 Or, if you have an existing site on the OpenLab or an external site outside of the OpenLab, you can choose to Use an existing OpenLab site or Use an external site for your ePortfolio. If you created an ePortfolio on the OpenLab prior to Fall 2012 and you would like to link that site, please view the instructions here. To use an external site outside of the OpenLab, type in the URL of the site in the text box provided, and click check. 5. When you are finished, click Create ePortfolio and Continue. 1. Choose your Profile privacy settings. 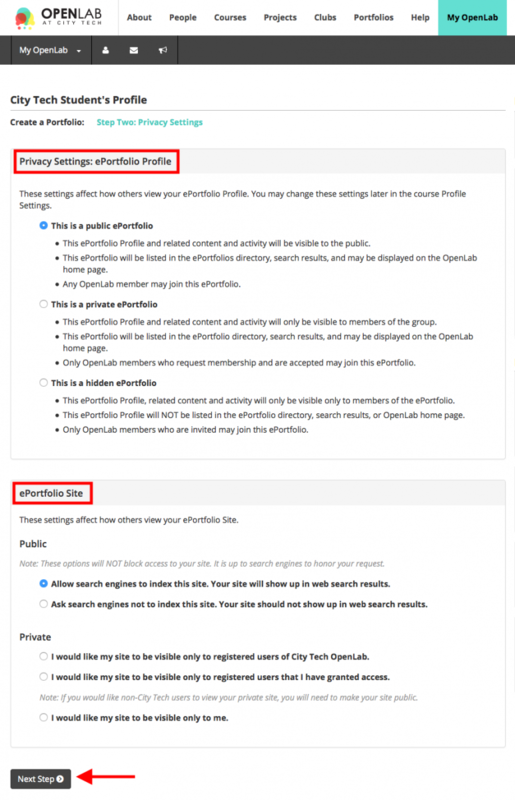 These settings control the privacy of the ePortfolio Profile, and are different from the Site, which you will choose next. This ePortfolio Profile and related content and activity will be visible to anyone, whether or not they are members of the OpenLab. This ePortfolio Profile will be listed in the Portfolios directory, search results, or OpenLab home page. This ePortfolio Profile, related content, and activity will only be visible only to members of your ePortfolio. This ePortfolio profile will NOT be listed in the Portfolios directory, search results, or OpenLab home page. 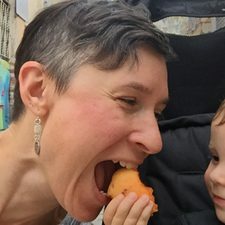 The link to this Portfolio Profile and Site will not be publicly visible on your OpenLab Profile. 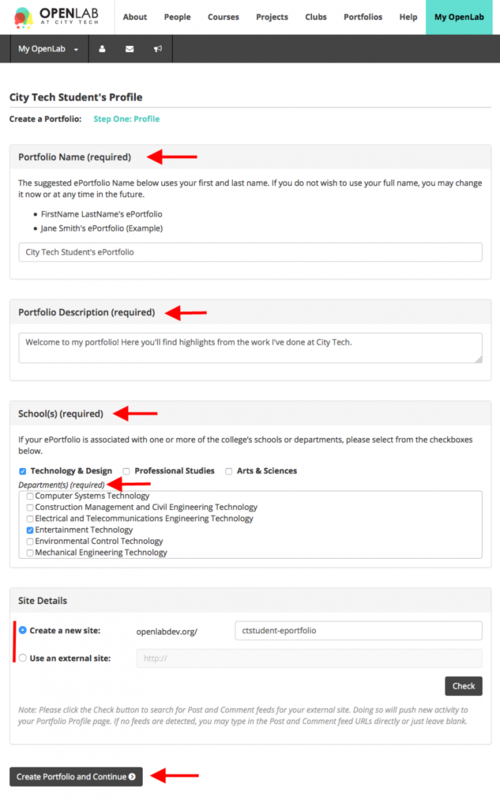 This ePortfolio profile will NOT be listed in the Portfolios directory, search results, or the OpenLab home page. 2. Next, choose the privacy settings for your ePortfolio Site. Anyone can visit your site without needing a password. Search engines will index all pages and posts, meaning your site will show up in search results on Google, Bing, and others. Choose this option for maximum public visibility. Choose this option if you want to be able to show the site to people who are not members of the OpenLab, but you don’t want people to stumble upon it via search engines. Anyone who is signed into the OpenLab can see this site. Choose this option if you’d only like the OpenLab community to be able to see the site. Choose this option if you only want members of your ePortfolio to be able to see the site. No one except site admins can see the site. You may choose this option if you are in the process of creating your ePortfolio, but it would rarely be useful for an active ePortfolio. 3. When you are finished, click Next Step. 1. 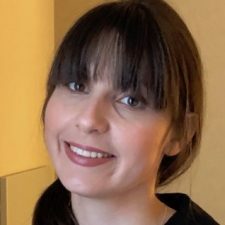 Upload an avatar (an image that represents your ePortfolio–it can be a picture of you, or an image that represents you or your work). If you have an image file ready that you would like to use as your avatar, click Browse or Choose File. Select the file you want to use from your computer or flash drive and then click Upload Image. 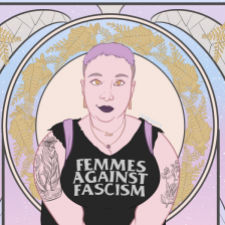 If you don’t have an image you would like to use you can always add one later–just click Next Step (if you are finished skip to the next section, “Step Four: Invite Members”). 2. 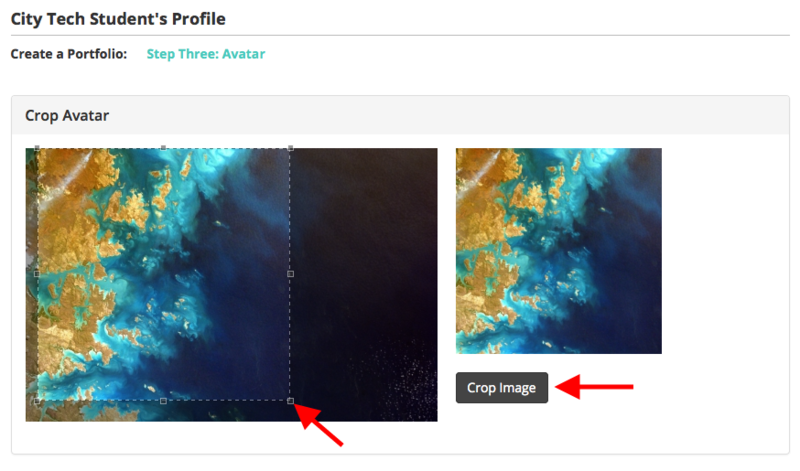 Crop the image by dragging the square around the portion of the image you want to use and click Crop Image. 3. 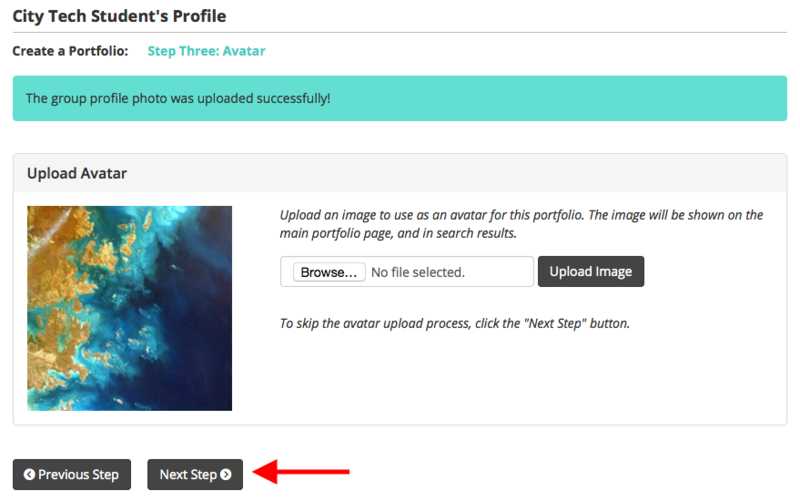 Once your avatar is uploaded, click Next Step. 1. 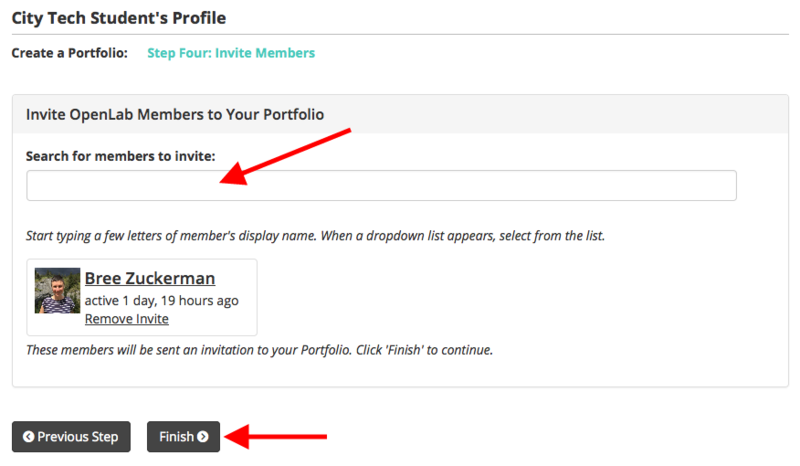 If you would like to invite members to your ePortfolio, start typing their display name. When a dropdown list appears, select their name from the list. Their name and avatar will appear under the heading Invites. When you’re finished, or if you do not wish to invite anyone at this time (you can always do it later! ), click Finish, at the bottom of the page. 2. 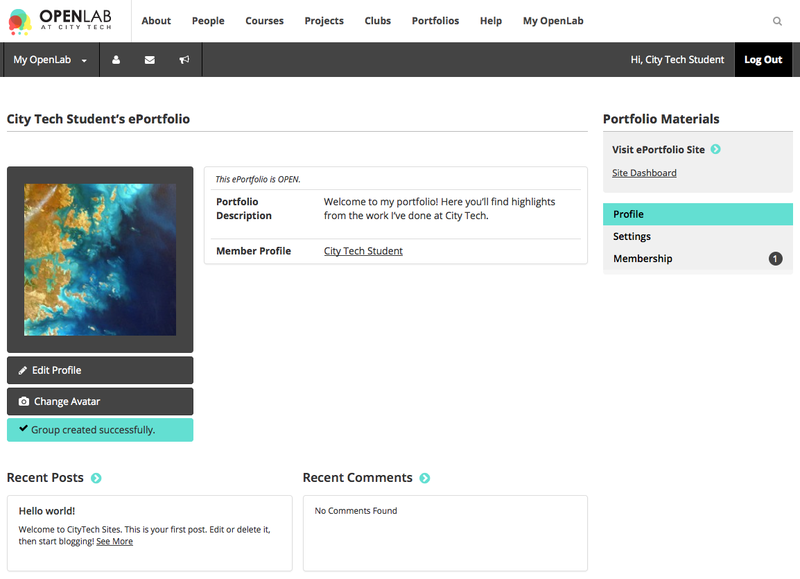 After you click Finish you will see your new ePortfolio Profile page! 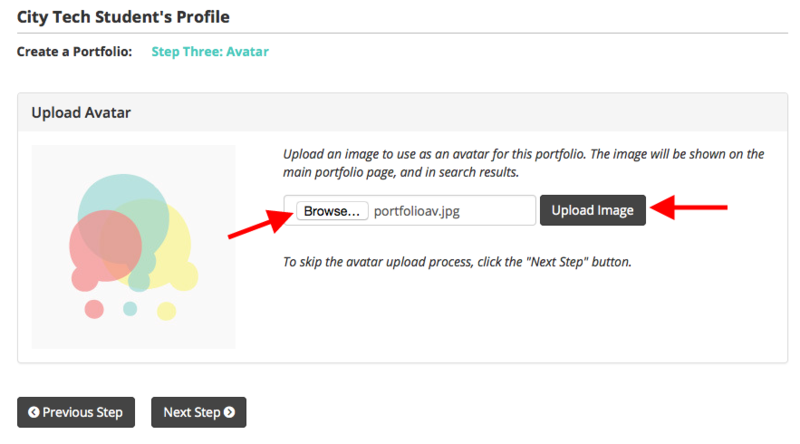 From here, you can (a) change settings such as privacy, ePortfolio description, or (b) change your avatar. From your ePortfolio Profile you can also access your (c) ePortfolio Site and Dashboard (the admin panel, where you will edit and add content to your ePortfolio Site). Here you can view a video kindly created by the ePortfolio support team that demonstrates how to create an ePortfolio. Before you start, you will need to first sign up on the OpenLab if you don’t already have an account.